Canada’s ethics csar will examine allegations the prime minister’s office may have improperly tried to help a firm avoid a criminal trial. A news report last week alleged that PM Justin Trudeau’s office pushed for intervention in the fraud case against engineering group SNC-Lavalin. Mr Trudeau has denied the Globe and Mail report, which cited unnamed sources. The firm is facing fraud and corruption charges related to contracts in Libya. On Monday, Canada’s independent Conflict of Interest and Ethics Commissioner confirmed he has launched an examination following a request from two opposition New Democrat MPs. Speaking in Vancouver, the prime minister said he “welcomes” the probe into allegations of improper conduct by government officials. Last week, the Globe and Mail newspaper alleged that the prime minister’s office had pressured former justice minister and attorney general Jody Wilson-Raybould to intervene in the case against the Quebec-based engineering giant. The newspaper reported that she had refused to ask prosecutors to make a deal with the company that would have avoided a trial. Ms Wilson-Raybould has refused to comment on the story, citing solicitor-client privilege. 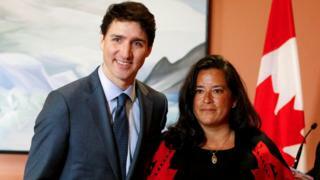 Mr Trudeau told journalists on Monday that he has met Ms Wilson-Raybould in recent days and confirmed with her they had a conversation last autumn, during which he told her all decisions related to the case “were hers alone”. SNC-Lavalin has argued it should be allowed to avoid a trial because it has changed following the federal charges and it has “worked tirelessly to achieve excellence in governance and integrity”. The firm is facing allegations that former executives paid bribes to win contracts in Libya under Muammar Gaddafi’s regime, which fell in 2011. It had hoped that it could come to a remediation agreement with prosecutors that would be an alternative to trial. The attorney general must consent to the negotiation of the agreement. Federal opposition parties have jumped at the allegations of political interference and are pushing to have some of Mr Trudeau’s top aides and a number of Liberal MPs appear before Parliament’s justice committee.